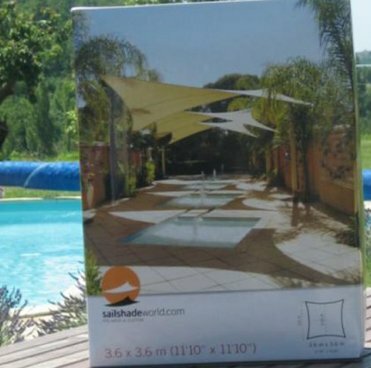 We are suppliers of Sail Shades manufactured by 'Shade Sail World' Australia which has over 60,000 satisfied customers worldwide. These Sail Shades are the best on the market. They are suitable for all situations where shade is needed. Made from High Density 220 g/m2 Shade Cloth, they also boast double point locked professional sewing and UV resistance, stopping 90%+ of harmful UV. 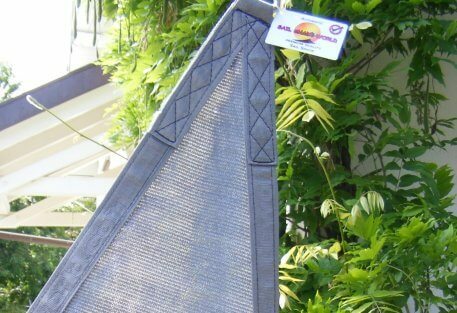 Quality - The Sail Shades we supply are of the highest quality. We do not compete with "cheap products that do not last" - to see the difference have a look at the comparisons photos below. With Sail Shades, as with so much else in life, you do 'get what you pay for'. Buy the best, buy 'Sail Shade World' shades. Reinforced edging - Instead of turning and sewing the fabric as do other companies, we use extremely strong seatbelt webbing around the perimeter of our Sail Shades. Easy to install - Sail Shades do not require professional installation. Visit our Installation Guide for more information. We can supply all stainless steel accessories necessary for installation. We offer Sail Shades in a variety of colours and sizes which allows them to be installed in places that would normally be difficult to equip. Our Sail Shades are only available to order via the internet. As we have no shop or associated overheads we are able to offer products of superb quality, outstanding service and fast delivery. Compare our Sail Shades below (in green and black/gray) and those made by a competitor. The superior quality of our Sail Shades can be easily determined by examining the straps, the strength of the seams and the calibre of the steel fixings. Click on a photo to enlarge. Here the quality difference becomes even clearer ! Quality - Our products are of the highest quality and are manufactured by Australia's leading supplier. As with so much else in life, you do 'get what you pay for'. Buy the best. Reinforced edging - Instead of turning and sewing the fabric as do other companies, we use an extremely strong border along the perimeter. Easy to install - No professional installation. Visit our Installation Guide for more information. We can supply all stainless steel accessories necessary for installation. We offer a variety of colours and sizes which allows installation in places that would normally be difficult to equip. Available to order via the internet. As we have no shop or associated overheads we are able to offer products of superb quality, outstanding service and fast delivery.